Tarps Plus Blog: Perfect Time For A Pool Cover! The Fall season is here and as the winds get stronger, the leafs change color they are also falling off the trees and falling in to your pool. Tarps plus has a cheap solution for you, a pool cover made by Tarps Plus. Currently Tarps Plus has added a lot of different sizes in pool covers to guarantee a size for your pool. All of the prices have been dropped to an amazingly low sale price. Not covering you pool in the fall and winter can cost you a lot of money in maintenance, protecting your pool with a pool cover is the way to go to save money. The pool covers are strong and easy to lay out giving your pool protection against rain, dirt, bugs, leafs and many other things. 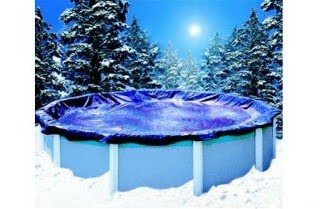 Take a look at the pool covers section on www.Tarpsplus.com and take advantage of our very low prices. I bought this pool cover 2 years ago and I loved it! I am back again for a new one. The pool cover I purchased from Tarps Plus worked out great! it was soooo much cheaper then my local pool stores too. After seeing my neighbors pool cover I purchased one for myself and it works great.